Jag blev väl omhändertagen på alla sätt, både vad gäller utbildningen och praktiska saker på plats. Vilket gjorde att jag kunde koncentrera mig fullt ut på det jag var där för. Nämligen plugga hårt. Du blir utbildad och certifierad på bara 6 dagar. Hos oss får du din utbildning och certifiering på rekordtid, en certifering du också genomför här på plats som en integrerad del av den intensiva, accelererade utbildningen. Allt är inkluderat. Ett engångsbelopp täcker alla kursmaterial, examen, boende och mat och erbjuder det mest kostnadseffektiva sättet att erhålla din MCSE: SharePoint kurs och certifiering på. Och detta utan några oannonserade ytterligare kostnader. Du klarar MCSE: SharePoint certifieringen första gången eller kan gå om kursen kostnadsfritt. Det är vår garanti. Vi är säkra på att du kommer klara din certifiering första gången. Men skulle du mot förmodan inte göra det kan du inom ett år komma tillbaks, delta i hela kursen igen, och bara betala för eventuella övernattningar och din examen. Allt annat är gratis. Du lär dig MCSE: SharePoint snabbare. Vi kombinerar de tre inlärningsmetoderna (Presentation|Övning|Diskussion) så att vi därigenom genomför kursen på ett sätt som säkerställer att du lär dig snabbare och lättare. Du lär dig inte bara teorin. Vi har vidareutvecklat MCSE: SharePointkursen med fler praktiska övningar som ger dig det extra du behöver för att kunna lösa praktiska problemställningar och klara din certifiering. Microsoft - MCSE: SharePoint 2013 Vad ingår? Microsoft SharePoint Server 2013 is a document storage and collaboration platform that offers many benefits to Organisations. SharePoint deployments may take many different forms in scope, where a deployment may be focused on only delivering one feature, such as enterprise search, or many features, such as document management, business intelligence, web content management, and workflows. Deployments can also differ greatly in size, with small deployments of a single server up to large deployments with farms of 15 or more servers. In this module, you'll learn about the core features of SharePoint 2013, the new features in this version, and what has been removed. you'll also learn about the basic structural elements of a farm deployment and how they fit together. Finally you'll learn about the different deployment options available to SharePoint 2013. Information architecture (IA) defines the structures by which an Organisation catalogs information. Designing an IA requires a detailed understanding of the information held in an Organisation and its usage, context, volatility, and governance. A good IA rationalises the creation and storage of content and streamlines its surfacing and use. In this module, you'll learn about the core elements of IA design and the facilities and devices available in SharePoint 2013 to deploy an effective information management solution. Explain how understanding business requirements drives the design of an Organisational IA. In this module, you'll learn about installing SharePoint 2013 in various topologies. you'll learn how to configure farm settings, and how to script the installation and configuration of SharePoint 2013. In this module, you'll learn about the key concepts and skills related to the logical architecture of SharePoint including web applications, site collections, sites, and content databases. Specifically, you'll learn how to create and configure web applications and to create and configure site collections. In this module, you'll learn about the various authorisation and security features available in SharePoint 2013 to help you maintain a secure SharePoint environment. Specifically, you'll be learning about authorisation and permissions in SharePoint 2013, and how to manage access to content in SharePoint 2013. Understand and manage authorisation and permissions in SharePoint 2013. In this module, you'll learn about the authentication infrastructure in SharePoint 2013. you'll learn how to configure SharePoint to work with a variety of authentication providers, and you'll learn how to configure authenticated connections between SharePoint and other server platforms. In this module, you'll learn how to secure and harden your SharePoint 2013 farm deployment and how to configure several security settings at the farm level. Plan for and configure user profile synchronisation with Active Directory Domain Services. In this module, you'll learn about the new architecture of the Search service, how to configure the key components of search, and how to manage search functionality in your Organisation. Careful planning and configuration alone will not guarantee an effective Microsoft SharePoint Server 2013 deployment. To keep your SharePoint 2013 deployment performing well, you need to plan and conduct ongoing monitoring, maintenance, Optimisation, and troubleshooting. In this module, you'll learn how to plan and configure monitoring in a SharePoint 2013 server farm, and how to tune and Optimise the performance of your farm on an ongoing basis. you'll also learn how to use a range of tools and techniques to troubleshoot unexpected problems in your SharePoint 2013 deployments. This module is an introduction to the architectural features that underpin Microsoft SharePoint Server 2013, both for on-premises and online deployments. This includes an exam of the features that are new in this version, as well as those that have been removed. This module reviews the basic structural elements of a farm deployment, and the different deployment options that are available in SharePoint 2013. This module examines high availability and disaster recovery in SharePoint 2013. When designing high availability and disaster recovery strategies for a SharePoint farm, it's important to understand the different approaches required by each logical tier in the farm. High availability for the database tier requires understanding of how SQL Server provides high availability and the associated requirements. High availability for the application tier can be straightforward for some service applications, while other applications, such as Search, require additional planning and configuration for high availability. The web front end tier will also require additional planning and configuration for high availability, and architects should consider the new SharePoint 2013 request management feature. SharePoint farm disaster recovery has always required considerable planning and understanding of the necessary components and backup tools available. In this regard SharePoint 2013 is no different, and farm administrators should create a disaster recovery plan that states how content and configurations are backed up, how data can be restored, and what backup schedules are required. Service applications were introduced in SharePoint 2010, replacing the Shared Service Provider architecture of Microsoft Office SharePoint Server 2007. Service applications provide a flexible design for delivering services, such as managed metadata or PerformancePoint, to users who need them. There are several deployment topologies available to you when you plan your service application implementation. These range from a simple, single-farm, single-instance service application model to more complex, cross-farm, multiple-instance designs. What remains most important is that you create a design that matches the needs of your organisation's users in terms of performance, functionality, and security. Most organisations store information in a variety of disparate systems. In many cases, these organisations want to be able to view and interact with information from these disparate systems from a single interface. This reduces the need for information workers to constantly switch between systems and creates opportunities for power users or analysts to aggregate data from multiple sources. In SharePoint 2013, Business Connectivity Services (BCS) is a collection of technologies that enable you to query, view, and interact with data from external systems. In this module, you'll learn how to plan and configure various components of BCS. Talking about connecting people in Microsoft SharePoint Server 2013 really means talking about taking people out of their isolated workspaces and giving them the ability and tools to collaborate with other people in the organisation such as their work colleagues, peers, and executives. It is about finding people with expertise, and identifying shared interests and about creating networks of people that share common goals. In this module, you'll learn about the concepts and ways of connecting people in SharePoint 2013. you'll examine user profiles and user profile synchronisation, social interaction features and capabilities, and communities and community sites in SharePoint 2013. Understand and manage user profiles and user profile synchronisation in SharePoint 2013. Understand and build communities and community sites in SharePoint 2013.
Business Intelligence (BI) continues to be an important area for large enterprise organisations. The key to successful BI is the ability to integrate the components that deliver the right information, to the right people, at the right time. Microsoft SharePoint Server 2013 Enterprise Edition provides a range of integrated solutions that enable both users and administrators across an organisation to develop BI solutions to fit their business requirements. These BI tools extend beyond SharePoint to provide consistent information management from personal data analysis environments, which use Microsoft Excel, through to departmental or organisational data repositories, which use SQL Server Reporting Services (SSRS) and SQL Server Analysis Services (SSAS). In this module you'll see how SharePoint 2013 can deliver BI solutions for your business. Explain the SharePoint BI architecture, its components, and how to identify BI opportunities in your organisation. In this module, you'll examine the configuration options in SharePoint Search that enable you to provide greater search result effectiveness by fine-tuning the service in various ways. The introduction of new functionality, such as result types and the increased move towards search-driven navigation mean that the role of the Search administrator has become even more important for business success. Search now enables you to delegate more of this management to site collection administrator and site owner levels, improving Search flexibility without increasing the administrative burden on a few Search service application administrators. This module also examines Search analytics and reporting. To help you in your management of a Search environment, SharePoint 2013 now incorporates Search analytics and reporting into the Search service, rather than in a separate service application, as was the case in SharePoint Server 2010. The reports available will help you to monitor the service and optimise its configuration. Describe how to use analytics reports to optimise your Search environment. Planning support for your ECM requirements requires a clear understanding of content requirements and how that content supports the organisation. This means that, as a best practice, many different organisational roles should have input into the ECM strategy and supporting features. The web content management capabilities in Microsoft SharePoint Server 2013 can help an organisation to communicate and integrate more effectively with employees, partners, and customers. SharePoint Server 2013 provides easy-to-use functionality to create, approve, and publish web content. This enables you to get information out quickly to intranet, extranet, and Internet sites and give your content a consistent look and feel. You can use these web content management capabilities to create, publish, manage, and control a large and dynamic collection of content. As part of Enterprise Content Management (ECM) in SharePoint Server 2013, web content management can help to streamline your process for creating and publishing web sites. As a SharePoint administrator, it is important to understand the features that are available in Microsoft SharePoint Server 2013. However, there are often specific functional requirements that may be part of SharePoint’s feature set but are not included in certain site templates. There may also be sites that require repeatable Customisation of lists or libraries, or custom code deployments that are necessary to add capabilities that are not available out-of-the-box. Developers use features and solutions to add and control these functionality requirements. Administrators, on the other hand, must understand how features and solutions are deployed and managed in order to meet user needs in a SharePoint farm. SharePoint apps are new to Microsoft SharePoint Server 2013 and provide an additional capability to provide application functionality within the context of SharePoint. SharePoint apps supplement the capabilities of farm solutions and sandbox solutions, while providing a user experience that offers a measure of self-service Customisation capabilities without putting the stability or security of the farm at risk. It is important to understand that governance must reflect the needs of the organisation and how it should best use SharePoint. Therefore, the IT department cannot be the only body governing SharePoint; input must come from corporate sponsorship across the organisation. The IT department must still act as the technical authority for SharePoint; however, this is just a single part of how SharePoint governance must be brought together from different parts of the organisation. 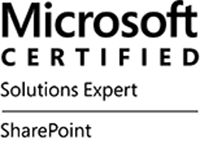 In order to get the MCSE: SharePoint certification you must have already gained either MCSA: Office 365 or MCSA: Windows Server 2012. "Jag blev väl omhändertagen på alla sätt, både vad gäller utbildningen och praktiska saker på plats. Vilket gjorde att jag kunde koncentrera mig fullt ut på det jag var där för. Nämligen plugga hårt. "